In sports, we hear the words “pressure,” “stress,” and “anxiety.” Some athletes accept “pressure” as part of sports and believe there is nothing you can do about it. What if you could learn to deal with pressure differently or a more effective way to manage stress that would allow you to perform your best? You can learn a lot by watching how elite players manage game-time stress and perform well when they are called upon. Michael Wacha, rookie pitcher for the St. Louis Cardinals was one out away from a no-hitter before his bid was broken up by Ryan Zimmerman’s infield single in the ninth inning Tuesday night. Wacha, 22, was a first-round draft pick out of Texas A&M last year and pitching in only his ninth major league start. The game had profound importance, not from a historical perspective, but due to its playoff implications. Importance often brings more pressure for athletes. Wacha secured the win over the Washington Nationals 2-0 and closed in on the NL Central title. With the victory, St. Louis reduced its magic number to three with four games remaining in their schedule. Wacha admitted that he was aware of the no-hitter, “You know if you give up a hit or not.” How was Wacha able to focus on the task at hand and not succumb to the pressure of a possible no-hitter and playoffs? High Confidence – Wacha built upon his previous successes. Wacha has a 4-1 record, a 2.78 ERA and allowed just six runs and 26 hits in 38 innings since Aug. 22. Wacha experienced pitching in different situations as he made six relief appearances. 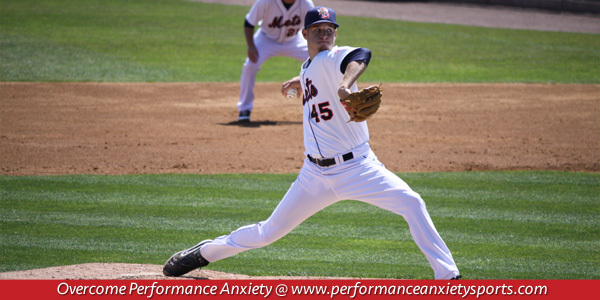 All athletes can benefit from Wacha’s recipe to manage pressure: remind yourself of your successes, focus on what you need to do at the moment to increase the likelihood of success, and trust your abilities and those of your teammates. Sign Up For a Free Mental Toughness Report!